Up to 100% leakage protection. Super absorbent core with liquid-locking gel that can't leak. Odour Neutralising Technology locks odours in, doesn?t just mask them and contains a light scent. Dermatologically tested sanitary towels to be gentle on skin. Comfortable topsheet to be super soft on your skin. Secureguard contours keeps fluid in check. 3mm thin for a great feeling of comfort. With wings to keep sanitary towel in place. No two women are the same, yet Always Ultra Long (Size 2) with wings offer up to 100% protection for your unique shape and flow. Ideal for light flow with L knicker size, moderate flow with M and L knicker size, or heavy flow with S knicker size. Always Ultra sanitary towels have Secureguard contours and liquid locking gel (that can?t leak) that pulls in the fluid to help prevent leaks. They also have Odour Neutralising Technology which locks odours and doesn?t just mask them. Although Always Ultra sanitary towels are just 3mm thin, they provide a great feeling of comfort and protection during your menstrual cycle. Rewrite the rules with Always MyFit, and get a leak-free fit for your shape and flow. 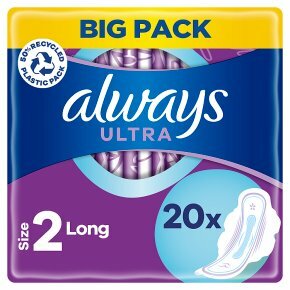 Try Always Ultra Secure Night (Size 4), Always Ultra?s best sanitary towels for night protection.